We're a family group based in Olympia, Washington, in the upper left corner of the US, a place some of us call Cascadia. 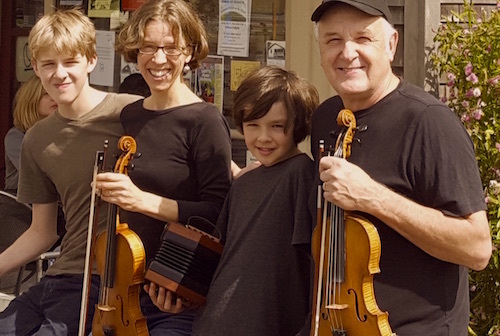 Randal and Susan play fiddles, Willie plays flute and Owen plays the concertina. Randal is a well-known fiddler and guitarist, with a long history of performing and recording Irish traditional music. Susan grew up in a song collecting family in Vermont, visited Ireland several times and developed a great, west of Ireland fiddle style of her own. Willie and Owen grew up immersed in Irish music, with frequent musical visitors, house sessions, and also at the music festivals and camps Randal organized over the years. 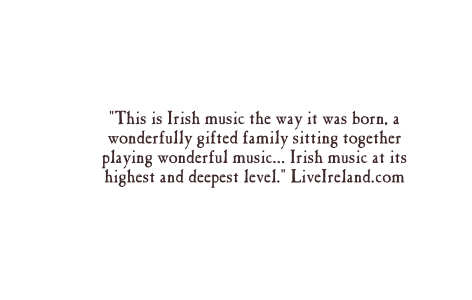 We play the kind of family music that's always been at the heart of the Irish tradition, and we try to bring some of the flavor of those house sessions to our concerts. Our dear pals Erynn Marshall and Carl Jones are trekking out to the Northwest from their mountain home in Galax, Virginia to play two concerts with us. Ireland meets Appalachia in the Great Northwest! Friday Jan. 19th in Seattle, Saturday Jan. 30th in Olympia. 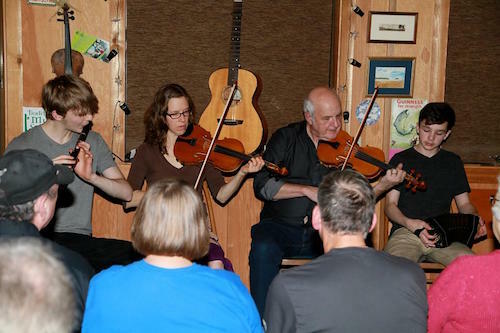 We had a great time playing a concert in Sam & Aine's "Wee Ceili Room" in Tualatin, Oregon last month. Many thanks to Sam & Anne for the warm welcome and to all the great folks who turned out to hear us and play with us after the concert. Willie plays flute and Owen plays concertina... they grew up in a musical household with their dad, Randal Bays and mom Susan Waters - both well known traditional musicians - meant a steady stream of great musicians at the house. 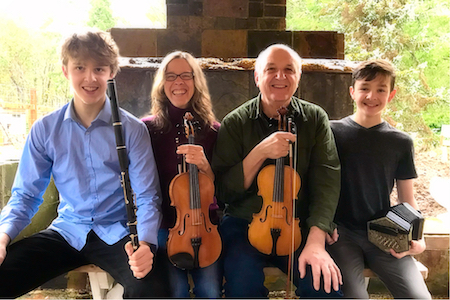 Both boys also got to meet and study with the many great Irish musicians on staff at Randal’s music camps over the years, including Caitlín nic Gabhann, Cormac Begley, Michelle Mulcahy and Florence Fahy on concertina, and Catherine McEvoy, Sean Moloney, Patsy Hanly, Sean Gavin, etc. on flute. 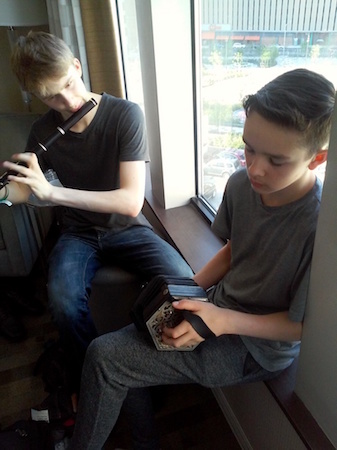 Both Owen and Willie took first place in their age group at the Midwest Fleadh Cheoil in 2017 in St. Louis. They’ve also spent time in Ireland where they played with many great musicians and studied with such famous players as Eamonn Cotter (flute) and Micheál O’Raghallaigh on concertina. They live in Olympia, Washington and play regularly at concerts and sessions with family and friends. Recently I found that my old instrument was losing its sound... a good old fiddle but it had apparently been badly damaged before I owned it and the poor thing had just been through too many major repairs. To my good fortune, master luthier Jeff Loen handed me his latest creation to try out, and I couldn't give it back to him. In fact I've hardly put it down since that day. It's a beautiful instrument modeled on the famous "Betts" Strad, which is in the Library of Congress instrument collection. (Interestingly, I got to visit the collection and play that Strad many years ago.) 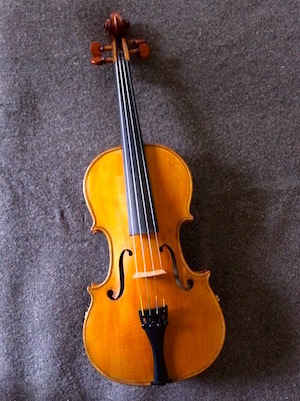 I'm in love with the sound and responsiveness of my new fiddle, hope to play it for you sometime soon. We love to play house concerts; there's no better way to hear music. It's not hard to organize and present one... here's everything you need to know about house concerts. © bays family music. | photos by people | Design by ceoltoir.